Recent Weather Observation in South-West Asia Region had shown an increase in both frequency and intensity of Dust phenomena, almost related to long severe drought periods, shrinking of green cover areas, shortage in available water resources, and over – grazing of natural pastures . The increasing trend of Dust phenomena as shown in fig. – 1, and the urgent need to begin a mitigation plan, showed the necessity of locating Dust Storm Sources (DSS) in the region, especially in case of limited remote-sensing resources and capabilities at that time. Fig. 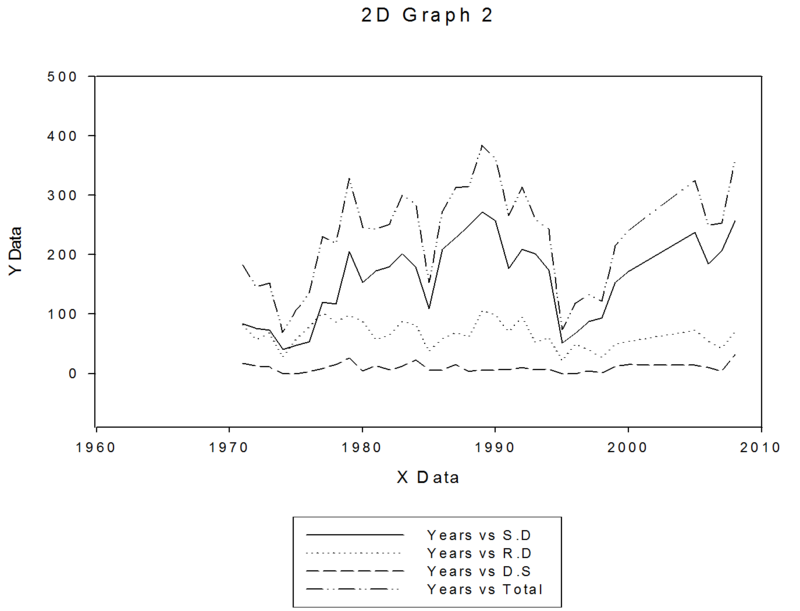 – 1: Time series of Dust Storms (D.S), Rising Dust (R.D), Suspended Dust (S.D), and total No. of Dust Phenomena (Total) for the period (1970 – 2009) in Baghdad weather observation site at Baghdad International Airport. Locating of Dust Storm Sources has a great importance in any Dust Storms study, and had two main uses; locating of DSS is essential for the most important step of Dust Storm forecasting, in terms of timing and intensity, of course besides information about the prevailing wind speed and direction causing the raised dust. Besides that, any attempt to mitigate DS effects on the environment of any region require locating DSS in that region, before any suitable treatment procedures for these sources can begun. -Using horizontal visibility estimated by weather observer in routine synoptic observation. Dust diffusion equation indicates that Dust particles concentration and associated horizontal visibility is inversely proportional to the distance from a Dust Storm Source. DSS characterized by loose sediments, powder-like, fine grain size particles enriched with silt and clay with essentially large size particles that share in the impact and disintegration process. Also DSS are characterized with scarce plant cover, and low rainfall amounts, which is a deserts feature. 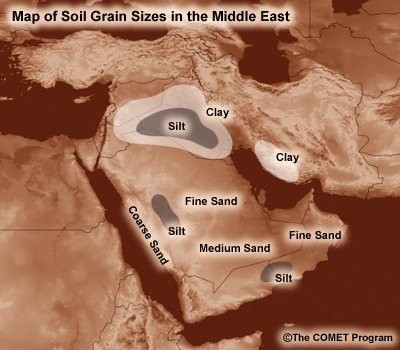 A map of soil type characteristics in South-West Asia is shown in fig.2,. Although soil tend gradually to go in a desert pavement process, anthropogenic factors may lead to soil degradation due to different scales factors, and consequently add much DSS to the natural increase of them mainly enhanced by desertification. Among these effects are, over-grazing, margin areas cultivation, and out-road vehicles movements. - Beds of dry aquifers. - Salty swamp, where plant growth is impeded by salts. - Flat areas flooded by rivers. Many observations lead to expect that most of Dust particles come from discrete point sources, such that its area is too small compared to the dust affected area. This is in a similar way to smoke stack . 2. Hobob (strong South-Easterly) associated dust. 3. Low-Level Jet Stream associated dust . Fig. – 2: A map of soil type characteristics in South – West Region..
-El Nino/ La Nina (ENLN). -Indian Ocean Zonal Mode (IOZM). Horizontal visibility iso-lines had been plotted besides the wind speed isotachs for many wide- spread dust cases at 2009, fig.2, where preferable dust projections was obviously shown, indicating probable source areas. Also Dust-affected areas are shown by horizontal visibility iso - lines. The inverse proportionality between horizontal visibility reported at an observation station and the dust-source distance from it was well known. Using the backward projection approach, by going back against the wind direction until reaching the dust source point, characterized by a very limited horizontal visibility, then the location of dust source was determined. Fig.- 3: horizontal visibility iso-lines for a wide-spread dust case (red lines) with isotachs (dotted blue lines). Previous studies  had shown that the ideal distribution of horizontal visibility within a dust storm may take the form shown in fig-4. Considering this form of horizontal visibility distribution, a table was constructed to estimate the wide – spread Dust Source distance relative to the estimated horizontal visibility at different observation sites in Iraq. The estimated visibility was taken three hours later after the first reporting of dust given by an observer to ensure that the lowest visibility was reported. 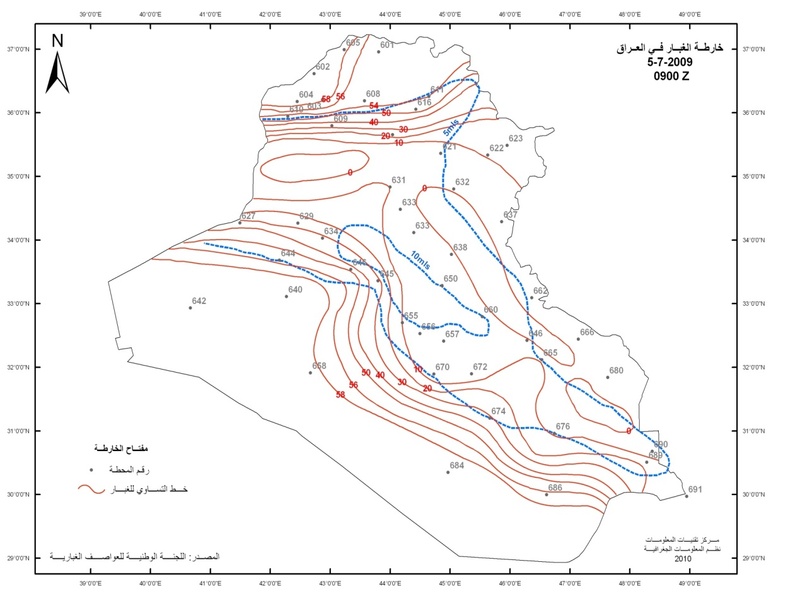 Using the backward – projection method, Dust Storm Sources was located in Iraq and neighbor borders as shown in the map of fig – 5. 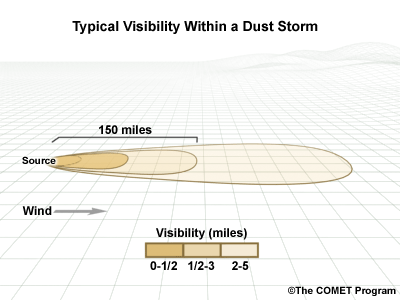 Fig-4: Typical visibility configuration within a Dust Storm with respect to the DSS location . 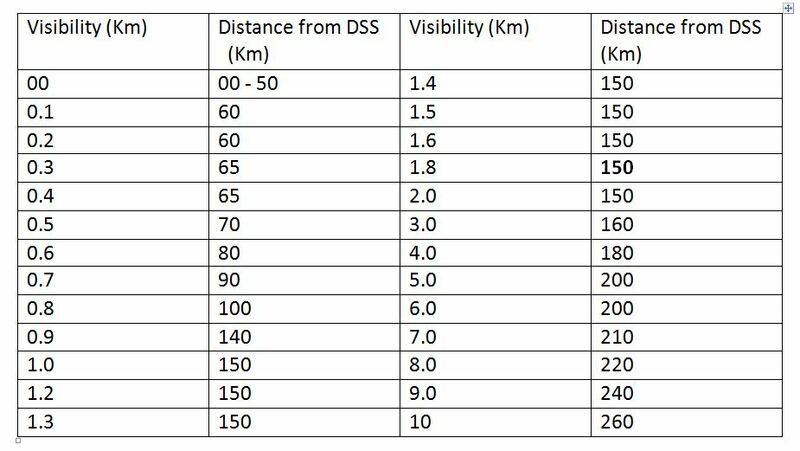 Table – 1: The relation between horizontal visibility estimate (Km) and DSS location from the observation site (Km). Dust Sources was located in shamal associated Dust Storms events since wind direction in these cases was persistent for a relatively long time and may reach few days a steady state may be reached within three hours. It is almost difficult to locate Dust Sources associated with Habob Dust cases due to the wide variability in wind speed and direction. It is possible to expand application of the method to locate DSS in nearby countries when the adequate wind and visibility observation are available. Fig. – 5 : Dust Storm Sources in Iraq using backward projection. 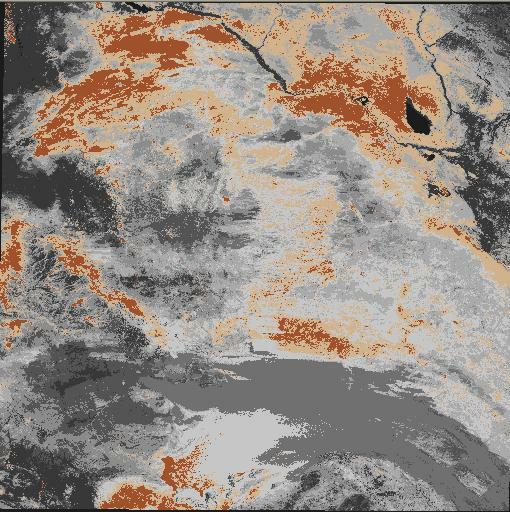 At 2011, the GIS unit in the Ministry of Environment , using the MODIS sensor productswith 250m resolution for the period 2009 – 2010 , and based on differential reflectance of water, wet soil, and dry soil, where the reflectance of wavelengths ranged between 41 µm – 179 µm respectively was used, a map of hot dust spotswas constructed through a comparison between dust plumes reflectance and different soil reflectance in wide spread dust storm cases as reported by the observation sites in Iraq. Their work supports the backward projection approach, especially to the west of Therthar lake and close to Iraqi – Syrian borders on both sides. Their locations are apparent in brown color in the map of Fig.6. Fig. 6: Dust hot spots as located using enhanced satellite images . 1. 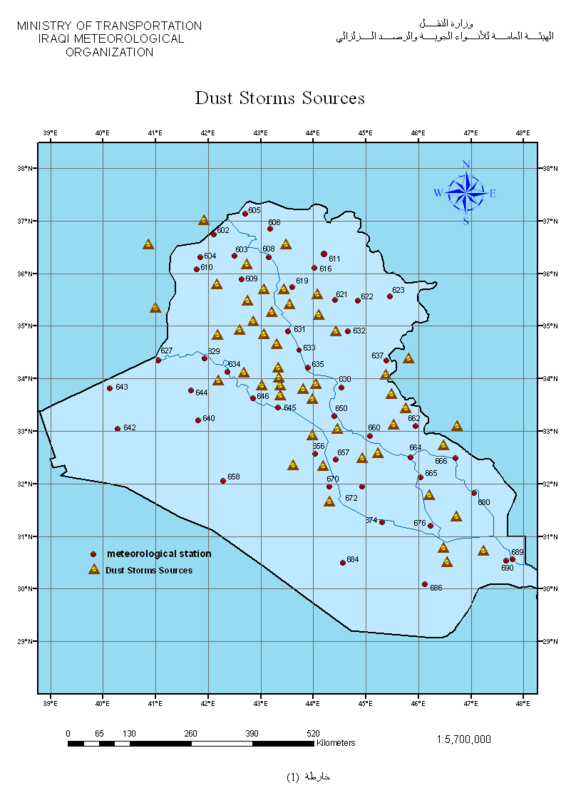 Iraqi Meteorological Organization & Seismology, 2011, Climatic Records, Baghdad – Iraq. 2. Mohamed Izo Safar, 1985, Dust and Dust Storms in Kuwait, Kuwait Meteorological Department. 3. Jacob Boyer, 2007, Dust Storm Forecasting, COMET Met Ed program. 4. Ali Karem Kadhum ,1997, Low – Level Jet Stream in Northern Arabian Gulf, M.Sc. thesis Mustansirya University, Baghdad – Iraq. 5. Department of Environment, GIS/ Remote Sensing units 2011.